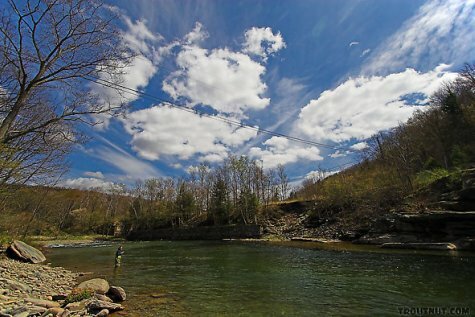 The Rapid River fly fishing is some of the best in the Northeast. There are two ways to reach fishable water, one is to walk one mile and the other is by taking a one-hour boat ride. Neither one of these methods is convenient, but you can make a nice day out of it. You really have to want to fish this great river, maybe knowing that there are monster brook trout in this stream is enough. This is a fly-fishing only river that is catch-and-release only of the Brook trout, which will keep adding to their massive size. You can keep up to 2 of the land locked salmon as long as they are over 12" in length. If you are looking for the biggest Brook trout in America and one of the best Brook trout streams in the world then Rapid River is the place for you. This river is fed from Richardson Lake and the fishing is good through Lake Umbagog. Since there is a dam on this river the flows are not always consistent. There may be 25% more flow on one day over the previous day and that is never any good for fly fishing. Rapid River is located near the New Hampshire border in the western Maine mountains, this is a very scenic area. View the larger map and find the Rapid River listed on the left column. Then zoom in as much as you want to see the area in detail or ask to get directions from anywhere. This is a pretty good map of many of the best rivers in America. There are plenty more rivers I need to identify so keep checking back as I will continue to add more MI fishing reports as quickly as time will allow. Leave the Rapid River fly fishing page and go to the Maine page.